Coming in at around the mid-price point for kitchen faucets is the Delta 9178-AR-DST Leland Single Handle Pull-Down Kitchen Faucet. This model is packed full of premium features to rival any brand, including a MagnaTite docking system that magnetically keeps the spray head in place when not in use. This solves the common problem of the spray head not properly retracting in the old weight system. With this model there’s no hanging spray head after years of use since the magnet will never wear out. Taking this product to the next level, the valve is embedded with diamonds, completely bypassing the problem of old valves getting worn out through overuse. This proprietary technology is called Diamond Seal technology and has become one of Delta’s finest trademark techniques. This is why, Delta’s catalogue is popular. Besides meeting ADA standards, the unit offers 1- or 3-hole installation for modern and traditional kitchens. Hard water buildup is controlled with the use of touch-clean spray holes that are built into the spout. Buyers without water softeners will appreciate how this feature keeps their investment safe from harmful hard water. Consumers will enjoy some of the most creative and attractive finishes to date with chrome, Arctic stainless, and Venetian bronze. There is a finish for everyone — the Venetian bronze in particular is an eye-catching finish when you walk into a kitchen. The MagnaTite docking system is everything that you could expect with a spray head attachment that keeps it in place at all times but still leaves enough leeway for you to easily pull it out when needed. The magnet keeps things secure but doesn’t overdo it in terms of strength. There are multiple water flows to play with, whether you want a powerful spray or stream mode for your kitchen task. All modes are activated by the click of a button and don’t require any complicated manuals to operate. The escutcheon (which isn’t included) is extremely sturdy and well built, and recommended if you plan on purchasing this kitchen faucet. Usually optional add-ons don’t come this highly recommended, but in this case, the quality of the escutcheon speaks for itself and should really be considered. Another optional accessory — the InnoFlex PEX supply lines — are capable of keeping water out of contact with metal contaminants and keeping the water inside the faucet at all times. A built-in color indicator lets you know the temperature of the water at all times, which is very useful for logging information about your setup. The aforementioned Diamond Seal technology is a revolutionary step in valve coatings and protects the valve for up to five million uses. This puts it ahead of just about anything else on the market in terms of usability and strength, so if you are looking for something that will last, this should definitely be your first stop. Even with all of the heavy duty equipment, Delta still managed to squeeze in a lifetime limited warranty on both the faucet and the finish. Its customer support is pretty good for the size of the company, and consumers won’t have to wait long for specific requests. Flow rate of the water is 1.8 GPM and the product dimensions are 9.2 x 12 x 9.2 inches. The spray and stream modes thankfully use a toggle switch so that when you power off and on the faucet, it will remember which mode you were using before. Accessing the switch is easy and doesn’t require multiple clicks. Using the lever can take a little getting used to when setting the water strength, and there will likely be some splashing the first couple of times. Learning how to adjust the strength of the lever, or rather, learning how sensitive it is, is a good idea in the first month after purchase. When comparing this design to another, it’s clear that this design has been copied by some other manufacturers, but with different features, which speaks to its popularity in the industry. The handle can be installed on the left or the right side, but make sure to read the instructions for the correct installation techniques. If you want something commercial but are price conscious, then the best alternative is going to be the Kraus KPF-1640CH Modern Nola Single Lever Flex Commercial Style Kitchen Faucet. It has the same magnetic docking that makes this item so desirable, but it does lack a robust spray head function. The Delta unit also has better finishes and some extra accessories thrown in that are missing from the Kraus product. If the Delta had motion control with its current features, it would probably take first place as the best kitchen faucet on the market. As it is, this is still a pretty good top-10 faucet to purchase. When it first came out, this faucet was a little on the high side, but over time the price has become more reasonable. This is the best time to purchase this kitchen faucet, as it is at the lowest priced the product has ever been. All the available finishes are well stocked, so if you see one that fits your kitchen, you’ll probably be in luck. Prices and stock are also unlikely to fluctuate around holidays, so don’t worry about availability. This is a near perfect kitchen faucet that really hits all the high notes in extras and features. 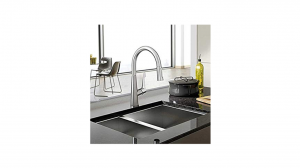 It sports 2 proprietary features that are not found in any other kitchen faucet on the market. That alone makes it worth the money, and yet it’s still being improved. The 3 available finishes are some of the prettiest that the kitchen faucet market has seen in a long time, with a design that has been duplicated several times over by other companies because of how well it sells. If other companies are copying your product, chances are the company is doing something right. For the consumer’s sake, the price could be a tad lower, but it is still a great deal when compared to other products in the same price range. A sale would help a lot but this is probably as good as the price is going to get for this item, especially at this late stage in the product’s lifetime. The Delta 9178-AR-DST Leland is an excellent model for any kitchen, especially if you’re not ready to branch into modern technology such as motion sense. If you want all of the capable technical features of an up-to-date faucet then this is the one for you. It has one-of-a-kind features that make it stand out from the many competing products in the market, and it is from a trustworthy company that aims to innovate. Check it out if you need a faucet that will last you for years without any problems.